Got a secret? Sasha Pieterse can keep it. Just like her Pretty Little Liars alter ego Alison DiLaurentis proved over seven seasons that she was well-versed in the art of withholding information, it turns out the actress is more than capable of keeping important information under lock and key herself. Take the just-announced PLL spinoff featuring her and Janel Parrish's characters, Pretty Little Liars: The Perfectionists. As Pieterse tells it, she's been in on the secret for quite some time. "I've known that we were gonna do this for about a year," she revealed to E! News backstage after night one of Dancing With the Stars season 25, week two. "Obviously, I hadn't been able to announce it yet. I didn't know they were going to announce it today. People kept coming up to me and congratulating me and I'm like, 'On what?' And so I'm so excited that I get to talk about it now. Janel's going to be in it with me. And [I.] Marlene [King,] our creator/producer for PLL is also the creator of this show, The Perfectionists. It's a new journey. It's an awesome journey. And I can't wait to start." And if you think that now that the show's been announced, Pieterse's ready to spill all, well, you don't know PLL. "Sara Shepard who wrote PLL also wrote this book series. It has nothing to do with PLL, they're just kind of putting my character into it," she said when pressed for details. "It's still a murder mystery and it's a really interesting plotline. I don't think I can say anything yet!" Fair enough. Here's what we do know about the spinoff, which at this point is in the pilot process and hasn't been ordered to series just yet and takes place in the new town of Beacon Heights: "Everything about the town of Beacon Heights seems perfect, from their top-tier college to their overachieving residents. But nothing in Beacon Heights is as it appears to be. The stress of needing to be perfect leads to the town's first murder. Behind every Perfectionist is a secret, a lie and a needed alibi." AKA, your next Freeform obsession. 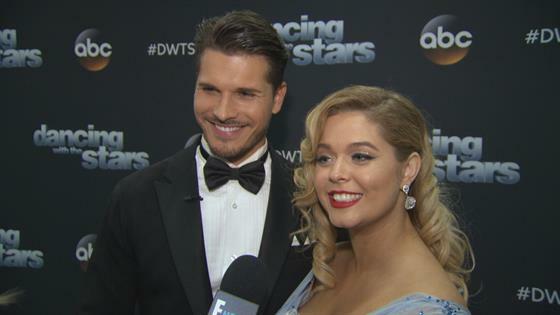 Before Pieterse can turn her attention to The Perfectionists, there's the little matter of her cutthroat competition to take home the mirrorball trophy on this season of DWTS. First up? Tonight's Latin Night. "We're doing a samba to 'Most Girls.' It's an awesome song," her professional partner Gleb Savchenko revealed of their plan of attack. "We've got a great concept and message behind the dance. I'm so happy that you were so good tonight. So hopefully we can repeat it tomorrow." "I think the song is really awesome. It has such a deep message and we're gonna play on that and from my own experiences," Pieterse added. "I think, and I hope, the fans will love it and agree. So here goes nothing. We're excited." To hear more from the pair, including what it's really like to have her professional dancer parents in the rehearsal room, be sure to check out the video above! Week two of Dancing With the Stars season 25 continues on Tuesday, Sept. 26 at 9 p.m. before settling back into its regular night and time, Mondays at 8 p.m., on ABC.